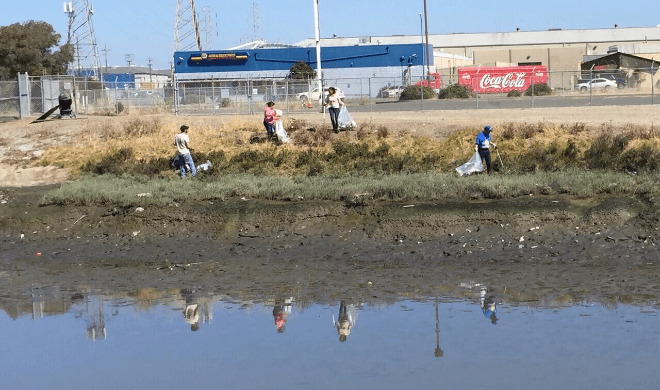 OAKLAND, CA - AEG Facilities and the City of Oakland partnered on a summer cleanup event to remove litter along Damon Slough that borders Oracle Arena and O.co Coliseum earlier today. By providing site access, parking and interested staff for the clean-up effort, AEG Facilities offered ecological benefits, stewardship, and wildlife protection to one of the largest and most important estuaries on the West Coast. The City of Oakland contributed significantly to the event by supplying staff that participated in the cleanup efforts and supplies that included gloves, bags, buckets, litter grabbers, water coolers, nets, small rakes and rubber boots. The event collected over 110 bags of garbage, the contents of which will be sorted and disposed of properly.